Plot Summary: Orphen is the greatest sorcerer that the tower has ever seen but he is more interested in chasing the Bloody August, an infamous and very mysterious dragon. Along with his apprentice Majic and their companion Clio he heads off on a quest with the Sword of Baltanders, the only thing that can free the Bloody August or ‘Azile’ from the spell she is under. Since it hasn’t been made yet, I figured I would. Started watching these tonight since they’re on my backlog. It’s a rather fun series with a solid story that tends to get overlooked most of the time. Shoot I got the box set of both series. It goes on sale often at Rightstuff. This was actually one of TBS’s biggest hits internationally. ADV actually groomed it for a TV run, but it never really took off in the US. In fact, if you pay close attention you may notice that the translation tone and dialogue change slightly about half way through season 1. There is even a gag real with Stephen Foster promising the show will be more faithful as one of the extras. Season 1 is really good. Unfortunately, season 2 is not nearly of the same quality. The animation even seems to be done on a lower budget. It does start to improve after a few episodes, but it never approaches the quality of season 1. Still overall, it’s a decent show, and the extras are pretty damn good. The gag scenes with Hillary Haag and David Matranga are almost worth the cost of admission alone. What the difference between the one Sentai printed out and the ADV versions? You know, other then the DVD count and box design. Was the series remaster? Did they do anything different with it? Sentai’s initial releases have the discs for each season on a stack pack and have more eps per disc than the original adv DVDs (which does make Steven Foster’s cameo extra slightly less funny). They didn’t remaster it or anything, there’s no miraculous high-res widescreen edition or anything like that. The show is still pretty good, even if it did reverse the casting for Shelley Black and Kelly Manison in the dub. The extras are great, they’re hilarious gag outtakes. It’s no Bubblegum Crisis or Gilgamesh in terms of extras, but the extras it has are, IMO, better than the show. The extras are also concentrated on fewer DVDs in the Sentai release, which takes away some of the humor in one of Hilary Haag’s (the “sexually ambiguous troll”) outtakes. David Matranga’s role in Orphen makes his role in Guin Saga that much funnier, or vice versa if you saw Guin first. 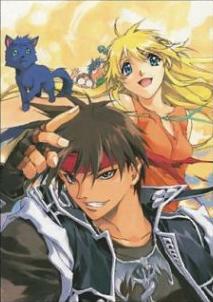 Orphen is also a rare Spike Spencer anime main role. …I just want know what the difference was, I even said “other than the DVD count and box design”. I OWN the old ADV boxes, I want to know what the quality difference was. Is there anything different at all? Hell, I bought this when the VHSs were coming out nearly 10-15 years ago. And yes, they could’ve remastered this if they has the original film, MB did so with Rayearth, again, that’s why I was asking. Obviously there’s no remastered version, the same quality streaming video and same resolution on the Sentai releases should have given you that much. You were just talking about the extras, and David’s role as Orphen and talking about Guin Saga, and talking about how it was one of Spike’s few main roles. In my original post, I said there was no remaster. That’s all, in fewer words, I said in my second post. Therefore, since you say I answered your question in my second post, I answered it in my first post as well. Second sentence, first post. Scroll up and take a look. Look at it this way, if anyone else had any questions about it, they have their answer. Vasta, if you have the ADV thin packs or singles, then yours will likely have the better video quality. The Most recent Sentai release has more discs per episode and has a lower bitrate as a result. Generally, when you are dealing with re-releases that have six or seven episodes per disc, the older releases will have better video quality. The same can be said for the double stack pack of Orphen that ADV and Sentai released together two years ago. Also, the most recent release of Orphen is in a double width DVD keepcase (one with flippers). It is not a stack pack. This series they overproduced volume 6 of the singles of the first series and I ended up with some back when I was buying wholesale lots. Come to find out, the title of at least one episode ghosts through the entire episode, so maybe they re-ran these and that’s why vol. 6 is so common. Is that unique to my DVDs? It’s one of the last five or six episodes; I forget which one. Thx for the update, both of my Sentai versions of orphen have been relocated to better 3rd party cases for storage and signatures so I didn’t recall that Sentai had unstacked the newest one. Does more eps on a disc mean lower quality? I don’t think it does here as the newer releases use the now-cheaper dual layer DVDs as opposed to the ancient single layer DVDs of yesteryear. I kinda liked those, they resulted in better art boxes due to increased size. I’m skeptical of the original DVD releases by adv for video quality. I think they’re single layer with 5 episodes on them, which is pushing it for space. Though honestly, it’s not as though orphen is a visual masterpiece to begin with. Orphen had some good points, but its average 90s art and animation aren’t among them IMO. It’s no bgc or patlabor (movies). I haven’t heard that before. I don’t see it on my Sentai DVDs or the streams. I’ll have to check my original adv DVDs as that’d be a pretty cool glitch to have. More episodes on a disc doesn’t automatically mean lower video quality, but with anime it’s generally been the case. Sentai’s releases aren’t nearly as bad as Funi’s early singles, and their first attempt at box sets though. The video quality on Ghost Hunt and Aquarion is so bad on my HDTV, that they look like Chinese bootlegs. I’m not saying that Sentai’s video quality is bad, but even their best DVD releases, like Clannad or Shigofumi, can’t compare to the best ADV singles, or even the last generation of Funi’s singles. Their boxset DVDs are still much better looking than Funi’s or even Nozomi. But there is a definite decrease in video quality from their singles. Hell, even some of their early 2000 stuff like Princess Nine looks amazing compared to Sentais boxsets. Of course, the increase in episode count has also been accompanied by lower budgets and less personnel. I’m sure that also has affected it as well. Hmmm. I can’t say that I’ve noticed. All SD releases look abhorrent to me on any 1080 display I’ve viewed them on. My first experience with Aquarion, since you mention it, was via Netflix on a 1080 plasma display (I try not to buy Funi physical releases) and it was a good thing that the show was so hilarious as it looked awful. If your actual dvds were of low visual quality too, perhaps then the show just is? Though if the DVDs were early enough, they could be the lower-capacity dvds where more eps would have to come at the cost of visual quality. Keeping dual-layer DVDs at high cost for so long did everyone a disservice IMO. But I can’t be sure as low-res stuff never looks “good” to me on high-res displays. Speaking of Clannad, as Sentai has not yet released the second season on blu-ray, I’ve been doing a lot of work with them. I can confirm that they are indeed dual-layer, but I don’t think they look materially worse than older ADV stuff. They look subjectively worse to me as I revile the Clannad artstyle, but that’s something entirely different. I had to, sadly, see the second half of Broken Blade on DVD, on a 42" 1080 LCD. That was horrid compared to the blu-ray. The PS3, the 360, and even the CCCP/PowerDVD on PC were powerless to upscale away the vast quality difference. Which is why I’m saddened that I had to buy the dvds of the newest Sentai stuff. As am I. I’m still saddened by the decrease in personnel. Sentai today reminds me of Media Blasters back in 2008 when, at Otakon, they said that they only employed 5 people and that between the dude at their booth (coughtablecough) and the people at the panel, their whole company was practically at Otakon. That’s pretty tragic. On Orphen, the show already looked pretty crappy. Orphen would be one of those shows, I’d imagine, that actually looks worse were it remastered as then we’d see more of the lower-budget animation. Not to mention that pillarboxing is a crime, and a remastered version would still be 4:3. Widescreen or bust. Pretty much all of Sentai’s and Funi’s boxsets have used dual layer discs. I’m pretty sure that all of Sentai’s DVD sets have been dual layered, except perhaps single features like Loups Garous. Also, for the record, some of ADV’s single DVDs look AMAZING upconverted on my TV. I was blown away by Princess Nine for one, especially given its age and the quality of some discs back then. It looked almost bluray quality. Raxhephon and Utawarerumono both also looked fantastic. So good encoding and space enough on the disc can make a huge difference. Finally, Sentai doesn’t have a huge staff by any means, but they have quite a few more than five, even when you factor out subcontractors. Well, I just fired up my Orphen singles (disc 1, season 1 to be exact) and it was about the same quality as the stream. Watchable, but no one would ever mistake it for HD. I’ve only streamed Rahxephon, the only thing I’ve done with my DVDs is take the shrink wrap off. 2 stack packs in a cardboard wrapper is brutal. Point being that I can’t yet comment on them on DVD, but they certainly aren’t going to be mistaken from blu-rays when they’re streamed from TAN. I’ve seen some of Utawarerumono (only watched for the dub cast) on DVD and it looked alright on DVD, with the relatively simple and contrasting art it upscaled well enough, but it didn’t look like a quality blu-ray to me, not from a mile off. Despite ringing endorsements from practically everyone involved in the show (including Matt Greenfield) I still haven’t seen Princess 9 (because the only way I can see it would be rips at this point), so I can’t compare it. DVD is watchable for me, but now that I’ve seen better, it’s so hard to go back. So then if it isn’t the disc’s capacity causing issues, then we’re down to crummier encoding or subjectivity to explain quality differences? Let’s not forget that back in the singles heyday, ADV for the most part used to pack them with extras like cast interviews, photo galleries, commentaries, etc. and those took up disk space. Now Sentai DVDs releases, for the most part, don’t. So that extra space that would have been used for those extras are used for more episodes instead.